Liz Ross is the founder of Coalition of Vegan Activists of Color (COVAC), which collaborates with individuals and community organizations to mobilize vegans of color to initiate vegan outreach and animal rights initiatives. COVAC also promotes veganism while collaborating with other social justice organizations. Liz serves on the advisory board of Food Empowerment Project, a vegan food justice organization that encourages healthy food choices that reflect a more compassionate society. 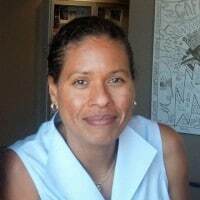 Liz also serves on the board of Black Skeptics Los Angeles, which is committed to building and promoting education and social justice work through a secular humanist perspective. As a former police officer, Elizabeth also raises awareness about the history and problem of mass-incarceration through presentations and group discussions, and volunteering for organizations that are working to counter its negative impact. Hello everyone. I’m Caryn Hartglass, and you are listening to It’s All About Food. And I am so happy to join you today. I’m very happy right now to be sitting down. I’ve just been through a whirlwind where actually recording a new food show, and we just barely finished recording a segment. And now I’m going to take a breath, relax and do what I love most, which is talk about my favourite subject: Food. Now, we have very special guests and I want to get right to it. Liz Ross, she is the founder of Coalition of Vegan Activists of Color. COVAC. And this group collaborates with individuals and community organizations to mobilize vegans of color. To organize vegan outreach and animal rights initiatives. COVAC also promotes veganism, while collaborating with other social justice organizations. Liz serves on the advisory board of Food Empowerment Project, a vegan food justice organization that encourages healthy food choices that reflect a more compassionate society. Liz also serves on the board of Black Skeptics Los Angeles, which is committed to building and promoting education and social justice work through a secular, humanist perspective. A former police officer, Liz also raises awareness of the history and problem of mass incarcerations through presentations and group discussions and volunteering for organizations that are working to counter its negative impact. Caryn Hartglass: Welcome to It’s All About Food, Liz. Caryn Hartglass: Thank you for taking the time out of your busy day to speak with me. Liz Ross: Thank you for having me; it’s a wonderful pleasure. Can you hear me well? Caryn Hartglass: I can, yeah. Caryn Hartglass: All right. Let’s see, do the folks at PRN hear my echo or not? So no more echo. I don’t think I have an echo. Okay, good. Now, let’s get started. Tell me a little about the Coalition of Vegan Activists of Color. Liz Ross: All right. So, I have been a vegan for about seven years. And I have been, I would say, in the vegan outreach movement and animal rights movement for about four years. But I’ve been in social justice for more than that. Recently I have been trying to, or not trying to, but actually doing… Trying to intersect the social justice non-vegan world with the vegan world. So I formed this group, actually early in January. And the idea is for me to collaborate with other organizations to bring the importance of intersectionality within the animal rights community, and hear the voices of people of color. So we are actually, I, in collaboration with Linda Alvarez, who is a professor at Cal State Northridge, we are going to launch our first people of color, animal rights and vegan food justice conference in 2016, which I am totally excited about. And the proceeds, any proceeds we have left over from the donations are going to go towards The Food Empowerment Project. So I’m very excited about that. One of the main themes that we’re going to start off with, to make it a little different from the traditional animal rights conference that FARM puts on, is to focus more on the why of veganism, with a little bit of the how to: strategies, bringing people in who’ve been in the social justice community with regards to vegan outreach and animal rights. We want to focus on the why because we believe that once we focus on the morality of animal rights or animal abolition, then people will start… It will encourage and motivate them to start looking for ways that they can do vegan outreach and animal rights outreach that tailors to their lifestyle. So that’s sort of like the idea with a little twist. Apart from the animal rights community, which usually works on more the how to part. I went to the 2013 Animal Rights Conference and we want to have a little twist on this. So I’m decided, and it’s going to be in Los Angeles. Caryn Hartglass: Okay well it sounds very ambitious. And collaboration is really important. There’s much more power in numbers and if we can gather with different groups and align on issues that we’re both passionate about, I think we can accomplish great things. I know that even within the vegan movement itself, it is somewhat challenging to get groups to work together. Caryn Hartglass: There are a lot of egos; there are a lot of issues. There’s so much passion, and people don’t agree on the same things. Just being human, it’s hard. Liz Ross: It really is, which is why I like Melanie Joy’s work. I’m sure you’ve heard of Melanie Joy? Caryn Hartglass: Absolutely, I’ve spoken with her a number of times. Liz Ross: Okay, cool. She talks about ways to communicate with people. Non-violent communication methods. And I think what she talks about when she talks about how to do outreach, we can implement that ourselves. So I think it is important, you have to bite your tongue, you have to compromise. You have to find ways in which you can communicate and build bridges. So it is a challenge. But luckily, with the people I have met who I have been able to form coalitions with, both anti-racist white vegans, as well as vegans of color. And I think it’s awesome, I’m having fun with it. Caryn Hartglass: Very good, well that’s important, that’s really important. Especially as an activist dealing with so many issues that can cause so much hurt and pain. To find ways to have fun with it. Because that’s the only way you’re going to be able to stick with it and really make a difference. So something that for me… I really work at seeing a broad view of things. And I remember when I first heard racism, homophobism, speciesism, sexism, how they’re all related and they’re all the same. And it opened my eyes the time when I first put all of that together. And ever since, I’ve been trying to see in my own life, exploitation in all levels. Discrimination, who has privilege over who, and what I can do about it. But I find that, as humans, we like to focus on really specific, single issues. For example, a lot of people like to volunteer for specific charities for different diseases. Maybe they’ve lost a family member to a certain disease, and they focus all their energy on a cure for that. And that’s great. But when we look back, and look at a broad view of things, we could really solve just about everything, all at once. Liz Ross: Yeah, I agree with that. I brought up the issue of understanding what’s going on within the black lives matter movement, for example. And how racism manifests itself in the vegan community, and in mainstream media at large. And one person told me, she said, “Well, you know, we can’t focus on everything.” My response to her was, “It’s not about you taking on every task. It’s about you understanding your place in society.” This was a white female. “And how what you say and what you do in outreach has ramifications, and can be interpreted in certain ways just by the very fact that you are a member of a particular group i.e. whether you’re white or black, male or female, transgender. So, it really depends. And it’s important to be cognizant of that. It doesn’t take a lot of… You don’t have to dedicate your whole life to one cause. Just spend time reading. Reading, talking to people, dialoguing with people. And I think one of the most important things is to validate the experience of people who have been affected by oppression. And that is something that seems to be challenging to people, particularly white people, because what happens is that they take it personally. And what I tell them is that you try to look at the approach of not taking it personally, as in “Oh my gosh, you’re just saying I’m a racist?” and therefore I get defensive. But rather, what is my position in society, and how is that being projected? And I think that’s a way to take out the personal from it, and try to look at in context as your position. Because whether you believe that racism exists or not, the reality is that if you look a certain way, and you say certain things, i.e. having representations of a man being lynched juxtaposed with a bloody cow being strung up, that you the agent, who happens to be a member of the dominant class, you are going to get a specific response from a group of people who feel that racism is alive and well. And these things can be triggering. So I think it’s important that we have to do a lot of reading. And try to have an open mind for people who have been unfortunately historically marginalized. Caryn Hartglass: So a lot of us have been sleepwalking through life. And we’re socialized, depending on how we’ve been brought up. We perceive things in a certain way, and if we’re sleepwalking we really don’t change those perceptions. It’s only until we wake up and start really looking around us that we realize that things aren’t exactly as we thought they might have been. Maybe you could give us a really subtle example of something where someone who is a privileged white person may do something that they never would consider is racist? Liz Ross: Okay. So FARM about a year ago, had on Facebook, an article it was called The Overlooked Plight of Factory Farm Workers. And it basically talked about the suffering and hardship that the farm workers have to go through. Now bear in mind, of course, that they are participating in violence of non-human beings. So the response for probably about half the people, and they were all white, was basically that these people have a choice, and regardless of what situation they are in, the bottom line is that we all eat animals, including humans. And the narrative was actually very violent at some point. And also racist. “These people need to go back to Mexico.” You know, those kinds of very violent kinds of comments. And at the same time, they ignore the CEO’s like Donny Smith, who is the CEO of Tyson Chicken Tyson Farms. And not even, they don’t even know them by name. They don’t call them out. They don’t talk about how these people in a position of power are actually exploiting both human and non-human beings. So when people react and push back and talk about these things, I think it’s important for the mainstream, white vegan community to recognize how biased and the double-standard in the way they are seeing things. Because they are part of the sub-group that basically believes we live in a post-racial society. And that racism is not very that significant and it doesn’t affect them in their lives, and they don’t adopt that mindset. So, that’s been a challenge. Because the thing about racism is that it adapts itself to every generation. So when we think that Jim Crow laws are absurd… Like for example, one of the laws was you cannot speak loudly in the presence of a woman. Black people weren’t saying, “Oh my gosh, this is an absurd law.” This was normal at that time. And it applied to everyone, including white men. But of course, it was black men who were lynched for these reasons. Now, at the same time, we have a law that says you cannot jaywalk. But what you see is a double standard. Or even marijuana. What you see is a double standard where people in mostly black communities, working class black and brown communities, are stopped, searched, frisked, harassed, and get ticketed. But you don’t see the same thing in these white, middle class communities. So there is a double standard, and it is important for us to recognize the double standard. One more example in particularly the war on drugs, is that, if you look at college campuses, including predominantly white college campuses, they are riddled with drugs. But there is no S.W.A.T. team at 4 in the morning, of which I was unfortunately a part of, breaking down doors. But you will see that in black communities, because of the stigma, and because of the double standard that we see. Caryn Hartglass: That’s your passion. We see it all the time. I just have to break for a moment. I don’t know if you can hear the Mr. Softie theme song here, but the Mr. Softie ice cream truck always seems to come around my neighbourhood right around this time. I just always like to put out that wish that one day, Mr. Softie will serve vegan ice cream, frozen treats that haven’t been exploited, and are prepared from workers who are treated fairly and who are paid fairly. That’s what I think of when I hear that song it’s like my Tuesday after 4:00 p.m. prayer. And thank you for that little break. And now back to our regularly scheduled program. So what I wanted to talk about was all of the white-collar crimes and they’re often white skin, white-collar crimes. They’re heinous, and they are done by people who are in power, and they are judged by people in power. And they get away with murder and many other things. And yet are prisons are filled with many people of color, who haven’t been given a chance. And some who aren’t even in there deserve to be in there for crimes that are just simple little things. It’s just very unfair. Liz Ross: Yeah, it’s very unfair. I think right now in the mass incarceration or criminal justice reform movement, of which I am a part of… One of the things we are trying to do is educate people and challenge them on their notions of what is a criminal. So for example, like I said, you have white people on college campuses. Or college people on college campuses who would smoke marijuana, and they’re not considered criminals. But you have people getting 10 years, 20 years for possession of marijuana. Not big marijuana for sale, as you would see off of a ship, but just a little baggie. And they are in jail for 10 years and they have been labelled a criminal. And what happens when they are labelled a criminal, is that when “do the time” they can’t get out and just say, “Okay, well I’m going to work hard and be this “good American.” Go to school, get my degree, and be productive.” What happens is that they are then on probation and they can be harassed by their parole officer. They have problems getting job, because now they are labelled a felon. So when you are labelled a felon, the constitution basically says that everyone has a right to vote and a right to all sorts of privileges, with the exception of if you are labelled a felon. And because of that, your rights are stripped. You don’t have access to public housing; you may not have access to school loans. So your life basically doesn’t start when you leave the prison. It actually continues this life of living a second-class citizenship status. So it’s unfortunate, it’s very, very unfortunate. And now with the criminal justice reform movement, we’re trying to change the laws. But what I’m concerned about is, Michelle Alexander talks about, in her book, “The New Jim Crow,” is that racism might start re-inventing itself again. Because the mindset, that is what we need to change. The mindset of labeling certain groups as criminals. The mindset of feeling that we can break down certain doors, at 4 in the morning, and target them. Is what we need to change. And that is the biggest challenge. And I hope that maybe not in my lifetime, but in the future, that that will change. Caryn Hartglass: Okay. So as a vegan activist, I remember… I haven’t done this in a long time, but I used to participate in the Ringling Brothers and Barnum and Bailey circus protest, because they use animals and abused animals in their shows. And we used to protest around Madison Square Garden in New York, and would hold signs and whatever while people were going in. And fortunately they’ve announced that they’re going to do away with using animals in the next few years, I believe, which is a good thing. But I remember a number of women of color were bringing their children in, and they were offended that we were doing this, because it was a terrible thing, and why can’t they just go to the circus and enjoy it. And so what I want to ask you is, where we would naturally want to say, “Don’t you see the oppression of animals, it’s just like when people were put into slavery, can you make the connection?” What do we do in circumstances like that? Liz Ross: Well, I think, to then invoke your “group” was oppressed, so why can’t you see that, is of course a mistake. Because there is a power play in that position and that can be counter-productive. Someone can easily look at the animal rights movement as a white person, and they can basically say, “Well look at you, you’re supporting… You’re fighting against animal liberation, but then your experiences and what you do shows that you are not an anti-racist.” So I don’t think these kinds of things really work. I think what we need to do is, I really think the animals, the non-human beings can speak for themselves. I think we can talk about their suffering; we can talk about commonalities within us as humans and non-humans. Like for example, we feel pain, we have social systems. They don’t want to suffer. Talk about the issue of do we really have a right to oppress non-human beings? But we don’t necessarily have to do that by evoking or showing representations of black oppression. Because what that does is your actually saying that you feel that they should be held to a higher standard that you. And we can even look at the issue in Israel. A lot of people believe that Israelis are oppressing the Palestinians. So I don’t think that just because a group has been oppressed, that we can necessarily just throw that out there, and say, “Just because you’re oppressed, then you should be able to see the similarities.” Because that is not how veganism works, actually. It’s about disassociation, or I would say, carnism, as Melanie Joy calls it. It’s about disassociation, and we have to sort of build those connections. So that these disassociations will not exist anymore. And we can look at the kinds of contradictions within, for example, why we love dogs, eat pigs, and wear cows. That’s more productive than using these representations, or talking about the suffering of, let’s say, slavery. The other thing that it does with these pictures, is that it actually can be triggering. Because usually the agent who is talking about that is a member of the dominant group. And the recipient, meaning the black person, is saying, “Well, you’re acting as if racism is a thing of the past, by bringing up, let’s say, a man who’s being lynched. Or a ship with people who are now “cargo.” And you’re acting as if racism doesn’t exist anymore, and it doesn’t affect us, and it does. I mean the black rights movement is talking about how, right now, black lives don’t matter. If you look at the FBI statistics, you will see that every week, at least one black person is killed by an officer. Every week. That is a lot. So it is happening every day. And to just bring out these representations, and evoke these times of slavery, I think is counter-productive. Because what it’s also saying is that using someone’s pain and suffering to then make your point. And you also happen to be in a position of power, which means that you the agent, is not even recognizing or appreciating the history itself. Because there’s no reason to believe that the agent, or the animal rights movement at large, mainstream animal rights movement, doesn’t also believe that we live in a post-racial society. So I think it is counter-productive, and I think these non-human beings really can speak for themselves, I really do. Caryn Hartglass: I like. I think they can too, if we would only pay attention and listen. Liz Ross: Yeah, we have videos showing suffering. I bring it up a lot. I talk to… Like for example, today I was at work, and we have bosses day this week. Caryn Hartglass: Okay, bosses need a day. Liz Ross: So one of our… The vice president, they were, “Let’s send her chocolates.” Her name is Roseanne. And I turned to this guy and I said, “Well…” He knows that I’m vegan, and I said, “I’m not going to send chocolates.” And he said, “Why not?” I said, “I’m not going to participate in this form of violence. That is not my philosophy and that is not part of my moral framework.” He didn’t argue. He actually said that his mood changed. So I think we can evoke the issue of morality. And we can talk about the fact that it is a moral issue. Even when I hear people say, “Well I’ll eat snakes and I’ll eat anything.” And then you say, “Well if you had a pet, would you eat your pet?” “Well, no.” There we go. Caryn Hartglass: Some people…. Not everybody answers that way. And that’s the puzzle of humanity. Liz Ross: One thing I do want to say is that, I also talk about… There are situations where I would say, if it were a human, would you feel the same way? That is different from using other peoples’ suffering like the pain that goes in with regards to black oppression. You’re talking about human beings as opposed to using someone’s pain when they’re going through that struggle right now. Caryn Hartglass: I just wanted to ask one last question. You used to be a police officer. Not sure quite how long you did that, but I imagine you learned a great deal from that experience. Liz Ross: I did. Go on. Caryn Hartglass: So you could share with us what you did get out of it. And maybe, if you have any enlightened words to say about where our punitive system should go with our police officers and all of the horrible things that have been going on. Not just lately, we’re just talking about the now but they’ve been going on for a long time. Liz Ross: Yeah. And I have two minutes, right? Caryn Hartglass: You can take your time. We can hold it a little longer. Liz Ross: Well, when I actually left the police department, that was a while ago, I’m showing my age. When we have the Columbine incident? So I left thinking, “Oh my gosh.” It was a mostly black community that I was patrolling. And I said, “Oh my gosh. We need to have the military police in here.” With regards to what’s going on with the drug war. And at that time, when the Columbine incident happened, it was big news and everybody was, “What’s wrong?” They were looking at these young men as… in terms of their upbringing. No one was saying this was an issue of white crime or white criminality. So you begin to have this idea of the war on drugs. And the group that was targeted were black working-class people, black and brown working-class people. They were the scapegoats, they were the targets. So over time, now you have a system of, like I said, where there are let’s say in some communities, 80% of the people, mostly men, have felony convictions. And when you have a felony conviction, you lose basically a lot of rights, and you can’t even work in most places. So now the cycle start repeating itself. And when I came in, the cycle had already started, and I didn’t even realize. I was like most people, the problem with black communities is black people themselves. All they need to do is work hard, and so on. And when I realized, after reading “The Jim Crow,” I realized it was much bigger than that, and it was literally an institution of racism that targeted a specific group. If we think about it, if we did that to college campuses, that would have ended a long time ago. Because parents who happen to be judges and hold political office, would have stopped that and said, “Wait a minute. We can’t be incarcerating all these college students. They have potential. Now we’re going to give them felony convictions, they don’t have potential.” That wasn’t happening. So this was going largely unnoticed because blacks constitute about 12% of the population. And of that, one would say, about 45%, or 40% may be living in working-class communities. I don’t have the statistics but that was the last one I heard. And of that, then there are a percentage of people who are victims of mass incarceration. That’s a very small percentage, and unfortunately, it is destroying these communities. And so now what I am trying to do is to spread awareness with regards to the issue of the war on drugs. So that we can have a system just like we did with alcohol prohibition. If anyone knows the history. When alcohol prohibition… When they were trying to lock everybody up, there were riots, and that changed everything. And alcohol became regulated. So I believe that it’s important that we should start moving towards regulating drugs and providing rehab facilities instead of locking people up for these convictions, because drug use is a mental health problem, it is not a criminal problem in my opinion. So as a police officer, and what I have seen in the community, I think we really need to have a paradigm shift with regards to drugs. And what we view, or whom we view as criminals. And how we view drugs ourselves. Am I making sense? Caryn Hartglass: You absolutely are, and I really like your message, and I hope we can make those changes. I hope we can get to that paradigm shift through non-violent means and not violent means. But sometimes, when things really boil up the way they are, violence becomes a way that change happens. So I’m just putting out my non-violent prayers. Caryn Hartglass: Thank you. And I’m glad you’re out there doing what you’re doing, I’m glad you’re vegan, thank you for being vegan. And for making coalitions with other great social justice organizations. Liz Ross: Thank you Caryn. Thank you for having me. It was my pleasure. Caryn Hartglass: Let’s take a very quick little break. I was just speaking with Liz Ross of the Coalition of Vegan Activists of Color. And we’ll be right back and we’ll be talking to Keith Mullen about veggie bites.